A New Orleans rhythm & blues, classic blues and originals band fronted by the dynamic Paul Rangell. She delivers lots of hot sax and harp as she tears the house down. "Rangell is a fine instrumentalist and more importantly, an effective vocalist who has her timing and delivery down... Fans of good New Orleans bar bands...will enjoy this one." -Living Blues Magazine. 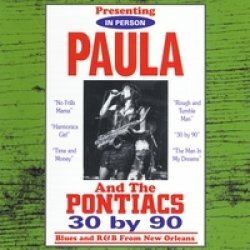 "As the elder statesman of Southern R&B enter their twilight years, Paula Rangell is waiting to receive the torch - and she's limbered up and ready." -Blueprint. The old adage says "good things come to those who wait." Now celebrating 25 years in the biz, Rangell's chops and husky voice seal the deal on "30 By 90".